Last week was downright gloomy; from the tragic events at the Boston Marathon to the strange weather all week. My son was on school vacation and that automatically changes the flow of our lives. I did not work out at all from Monday through Friday. Instead of tracking my food in Spark People like I usually do I resorted to pen and paper and did not bother to count calories. My weight was all over the place thanks to some water retention, lack of attention to my food intake and no exercise. I had so many other things going on sometimes something has to give and unfortunately it was my diet and exercise. Needless to say by Friday I felt pretty badly about myself. I had a long drive to upstate New York where I was going to visit one of my best friends and also to run a half marathon on Sunday, April 21st. I spent much of the drive listening to podcasts from Heather at Half Size Me. Heather has a very inspiring story as do the people she interviews. It was just what I needed to bounce back and stop the negative self-talk. I haven’t set too many running or fitness goals this year other than to run a race each month. So far I’m doing great with that goal. I ran one race in January, two in February, one in March and now one in April. I have nothing planned for May so I need to figure that out soon. I have a half marathon planned for the beginning of June. I am contemplating a full marathon sometime in the fall, but I’m not sure which one yet. I really want to do the Chicago Marathon, but darned if it doesn’t always fall on my weekend to work. Anyway back to my most recent half marathon. I signed up for the Plattsburgh Half Marathon a few months ago. Plattsburgh is located near the Adirondack Mountains on the western shores of Lake Champlain and is not far from the Canadian border. My Peace Corps site mate lives there so I’m happy to find any reason to visit the area. Due to other obligations for my husband and son it was decided that I would go alone on this trip. Much as I would miss my guys I haven’t had much alone time in the last 6.5 years so I relished the thought of spending quality time with my friend. Since I enjoyed a taper week of absolutely no structured exercise I decided to go for a short run on Saturday morning. It was a sunny day though quite breezy and cool. Midmorning I threw on my running shoes and hit the road. My friend lives in a rather rural area. I ran past quaint barns, a log house and lots of open fields. It was a beautiful run. The first half was a steady downhill with the wind at my back. I ran one of my fastest miles ever. Of course the return was not so easy, all uphill and against the wind! Still it felt great to get out there, stretch my legs and remember why I love running so much. The weather in Plattsburgh was crazy on Saturday. It went from sunny and breezy to cloudy and really windy to snow by the night time. Yet my weather app was still showing temps in the 30s-40s and sun for Sunday. The race was on Sunday at 8 a.m. so as I was getting ready that morning I popped on the race’s Facebook page and was thrilled to see the weather update was indeed calling for a sunny, wind free day. I got ready and headed over to the starting area. Normally I take a photo with my son, but since he wasn’t with me I asked someone to take one of me. I don’t save my bibs so this is my remembrance. I did my best to represent Boston. There were lots of runners on the course with their Boston paraphernalia on as well as spectators. In the minutes before the race began there was a moment of silence dedicated to those that were injured or lost their lives at the Boston Marathon. It was a somber moment. I would be lying if I said I wasn’t a little nervous. Truthfully I didn’t think anything would happen that day in Plattsburgh, but it seems like lately nowhere is safe. I was particularly concerned about my friend and her family coming to the finish line. I don’t ever want to feel responsible for putting others into danger. I tried to convince her to stay home. As always with races I set goals. The ultimate goal is to finish and have fun doing the race. Then there are those personal goals that have to do with time and speed. I’ve been running strong in the last couple of months. My speed has improved and I’ve noticed my endurance growing stronger. I think this is in part due to strength training, stretching and yoga. However, given how I was feeling about myself throughout the week the only personal goal reasonable was to try to beat my last half marathon time even if only by a second. 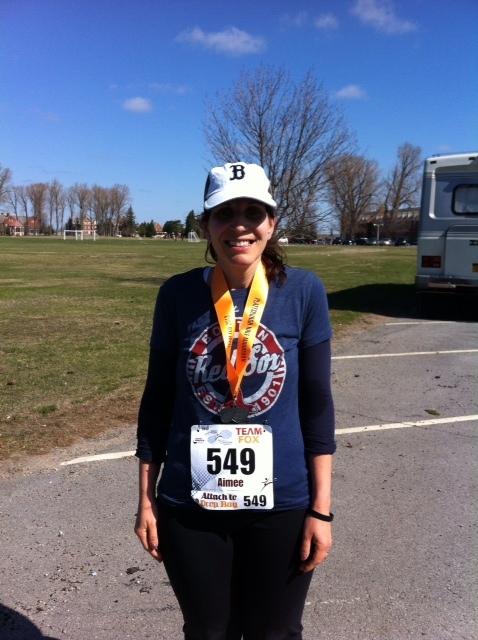 My last half marathon was the Lake Placid North Elba Half Marathon back in September. I ran it in 2:10:12. 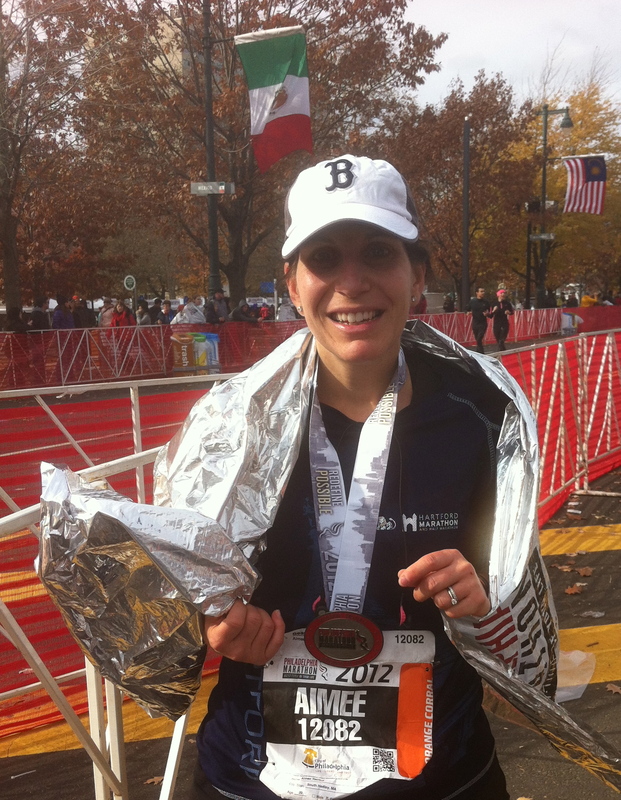 I just reread my post on this race and remembered how proud I was of my accomplishment. I did something a little different at the start of the Plattsburgh Half. Instead of relegating myself to the back of the pack I lined up in the back of the 9 minute mile pace group. The race started and off we went. The beginning of the course had us running on a bike trail along Lake Champlain. The views were gorgeous. We ran through the city and eventually through residential neighborhoods. There were spectators out cheering for us which is always wonderful. I especially loved the children at mile 6 who were handing out water on their front lawn. Running a half or full marathon is a fantastic way to see a new place. In the last few miles of the race we ran over a bridge and through an area with gorgeous old homes and then back down near the lake. The weather could not have been more perfect, sunny, cool, but no wind. As much as I enjoyed the scenery throughout the race I had a lot going on in my head. Running is my time to sort through things, feelings, emotions, stress, etc. I have a friend who is going through an exceptionally trying battle with cancer. I want to show her that I’m fighting for her. I want to be there as a support. I want her to know that I love her and I know she will beat this. Already I’m in awe of how she is triumphing over this hurdle. She has an infectious positive attitude. Her strength and courage are unmatched by anyone I know. I thought about her the most as I ran this race. For so many years I told myself I couldn’t…couldn’t lose weight, couldn’t excel in any sort of sport, couldn’t, couldn’t, couldn’t. I was full of negativity and self-degradation. I loathed running for most of my life. The thought of doing it for enjoyment was ridiculous. Running, ironically, has breathed new life into me. It has become my saving grace when I need to process “life” so to speak. It is my “me time.” It refreshes me, revives me and makes me feel strong. Though I have made peace with the treadmill I seek the freshness of running outdoors. I love the warmth of the sun on my arms and face. I even love the cool crisp air of a winter run. If I don’t run for a few days I actually miss it and crave it. Running has also made me somewhat competitive against myself. When I first started running I was weary of these PRs I heard other runners talk about. Oh great if I improve my time during this race then I have to keep improving it, I thought. That’s a lot of pressure. Yes and it’s also really exciting and motivating. While running Plattsburgh I pushed myself. My breathing was not easy as it sometimes becomes during a run. It was always just a little bit labored, not uncomfortable, but I was aware that I was working hard. I don’t wear my Garmin to race and there were no time clocks along the route. I really had no idea how I was doing time wise. I kept thinking about my friend. If she could fight this fight that her body is making her fight then I could push my body too. We are strong, stronger than we give ourselves credit for both in sickness and in health. I was running this race for my friend. Someday she will run with me. Every time I wanted to slow down or back off I thought about how my friend cannot slow down her fight so instead I picked up the pace. I smiled every step of the way as I ran. I was so proud to be running out of support for Boston and silently out of support for my friend whether she knew it or not. This race supports Team Fox which donates all proceeds to Parkinson’s Research and I was especially proud to be a part of the race for that reason as well. The friend I was visiting has a close relative suffering from Parkinson’s. As I entered the U.S. Oval of the old air force base for the last lap of the race I felt a surge of energy fill me and I started running as fast as I could. Then I saw the friend I was visiting. Darn her for coming out despite my pleas not to, but at the same time I was really overjoyed to see her. Then I spotted the time clock which from a distance almost certainly read 2:08. Oh my goodness that was much better than I expected. I started sprinting and as I got closer I realized that the 8 was actually a 3. 2:03?! No way. NO WAY! No that must be wrong. Seriously! Yes seriously 2:03:52 was my official finish time. I beat my last half marathon time by over 6 minutes. I teared up as the race volunteer placed the medal over my head. Oh Aimee, this post made me smile from ear to ear! My favorite line? “We are strong, stronger than we give ourselves credit for both in sickness and in health.” – Amen Sista! So proud that you crushed your PR! And glad that you got some alone time with a friend – everyone needs a break from being a wife and a Mom for a little bit every once in a while! HI Aimee! OMG–You really smashed that old time to bits! I love the description of how and why you love running too. I always feel so authentic when I exercise. Many of my best traits of appreciating the moment, trying again, pacing myself, laughing at mistakes, trying to be my best, figuring out ways to get better, etc… are used, and I remember how awesome I am. Well, definitely, this race showed your awesomeness and authenticity to you. I personally don’t know anyone who had a closer call regarding Boston than you and Carlos did. 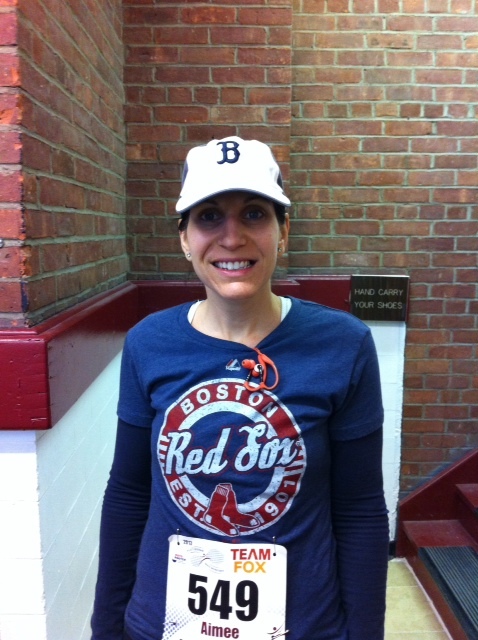 Nice to wear a Boston shirt during this race. That makes so much sense. Such a great story from start to finish! When I read that your breathing was labored the entire race, you basically gave a spoiler alert — I KNEW you’d PR! But wow, nearly 30 seconds per mile is a BIG PR! Congrats!!!! You’re knocking on the door of that sub-2 you know… (I remember having a 2:00:35 and feeling a mix of pleasure and disappointment, but certainty that I’d get it the next time). Very proud of you and your great race!! Great PR Aimee!!! What an accomplishment, I would have been emotional too! Great job! Wow, Aimee! I can’t believe you beat your time by SIX minutes! That’s awesome! Wish I could’ve been there to see. You had me teared up there at the end, too. Miss you. When are we going to lunch/ikea/hiking??? Awesome!! Congrats on a great race. I hope you get to Chicago for the marathon some day, it is a great one!